Exciting News!! 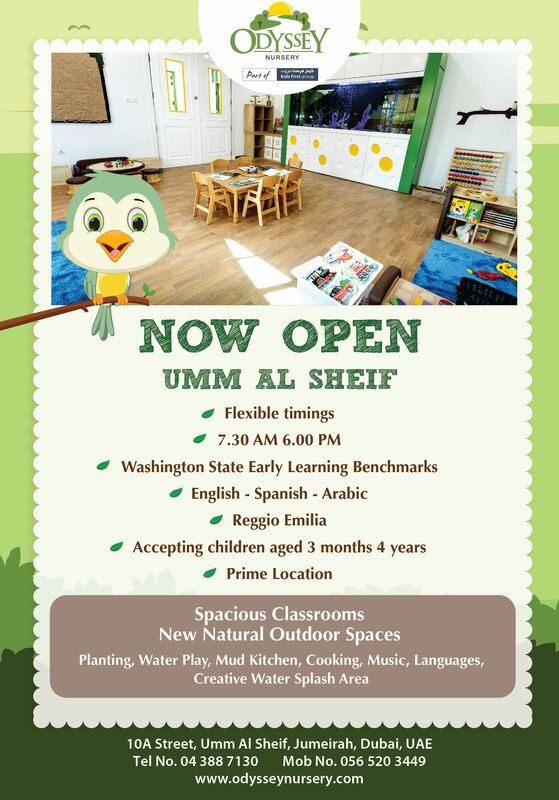 Kids First Group, the growing chain of nurseries that strives to set the highest standards in early childhood education for more than 7 years now, is expanding its presence in our beloved city, Dubai, opened a new branch called Odyssey BURJ. Our NEW Odyssey, located at Umm Al Sheif, facing Burj Al Arab area, located only a walking distance from the FAB metro station, with easy access from Wasl road and in close proximity to Burj Al Arab. The Nursery underwent amazing and impressive renovations where all their indoor and outdoor spaces have been upgraded to become a modern, 21st century learning facility, while still maintaining homey and cozy look. The outdoor spaces have been hand-made and are a unique addition to what you would expect from a reputable nursery. There are planting areas for veggies, mud kitchens, tools tables, water splash and different games you probably have not seen before. The classrooms are very spacious, and each has its own bathroom that is child's size appropriate. Odyssey follows Washington State Learning Benchmarks while incorporating Reggio Emilia traditional approach to learning. The Benchmarks emphasise that young children’s learning is multi-dimensional. Odyssey believes that play is child’s work and the curriculum is based around this philosophy. The language of instruction is English, while Spanish and Arabic are offered as second languages. Since UAE is the country where people from all around the world meet, knowing more than one language will help children to become a successful member of any community. Odyssey always welcomes children from different backgrounds and with different learning abilities. Come and visit the new premises and don't forget to spread the word!